Located in the South Texas Medical Center, we provide state-of-the-art custom power and manual wheelchairs, as well home medical equipment and disposable supplies such as urinary catheters, urological supplies, and incontinence supplies. 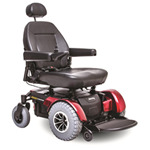 Standard power and manual wheelchairs, scooters and accessories such as seat and back cushions are available for purchase in our showroom. Drop off your prescription to our showroom or fax it directly to (210) 949-0434.